Speaking at the National Press Club in Washington, DC on 21 November, Ms McCarthy said she could not disclose what stance the final document would take. However, she said the agency is “certainly going to listen to the advice of the Science Advisory Board,” as laid out in its final assessment of the EPA’s June 2015 draft assessment. The most notable recommendation focuses on chemical toxicity and hazard. The SAB recommends the EPA compile toxicological information on substances such as chemicals, dissolved compounds and ions, and particulates employed in hydraulic fracturing in a more inclusive manner. 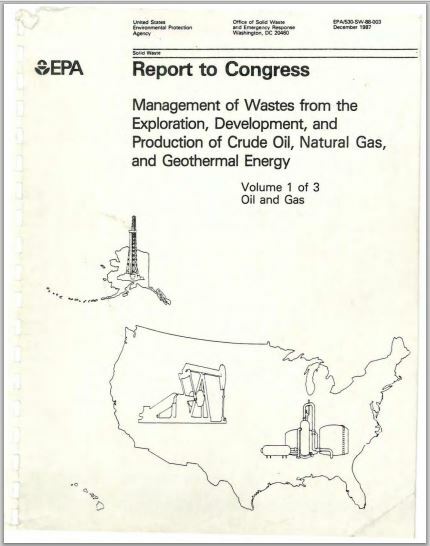 The SAB said this section should not limit the selection of hydraulic fracturing constituents of concern to only those that have non-cancer oral reference values (RfVs) and cancer oral slope factors (OSFs) that were peer reviewed by a governmental or intergovernmental source in earlier drafts. Instead, it should also include a broad range of toxicity data. This should include information pertinent to subchronic exposures from sources cited by the SAB. 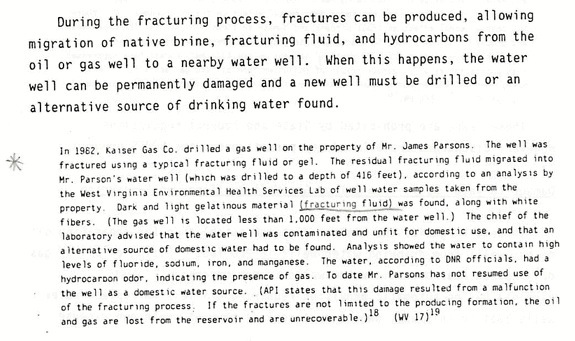 distinguishing between hydraulic fracturing substances injected into a hydraulic fracturing well compared to substances that come out of hydraulic fracturing wells in produced fluids. The agency says that the mechanism for getting data could be regulatory (under section 8 of TSCA), voluntary, or a combination of both. The proposed rule may include [unenforceable, legally immune] best management practices, third-party certification and collection, and incentives for disclosure of this information. Slide from Ernst presentations. More details below. 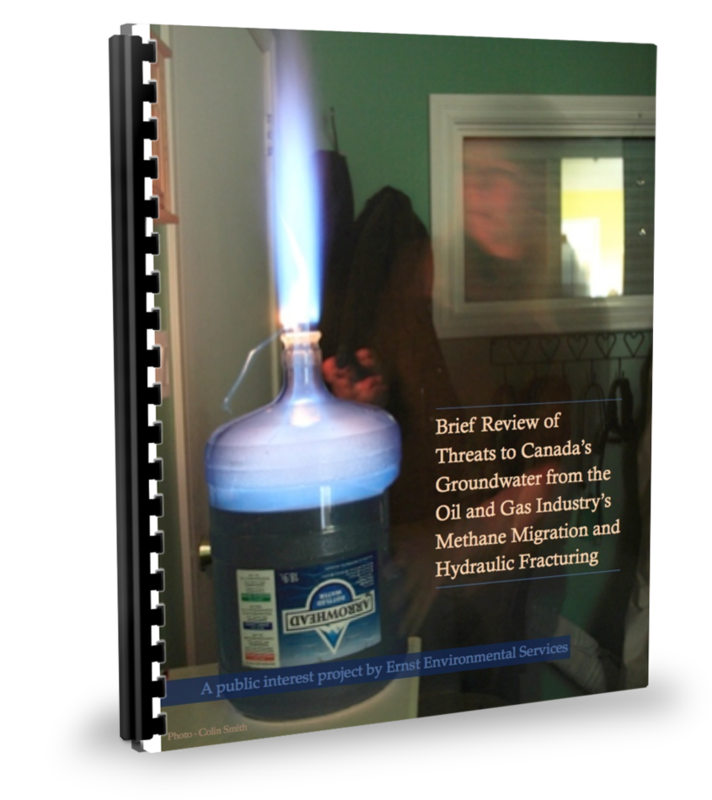 The U.S. Environmental Protection Agency (EPA) announced that it will conduct a comprehensive research study to investigate the potential adverse impact that hydraulic fracturing may have on water quality and public health. 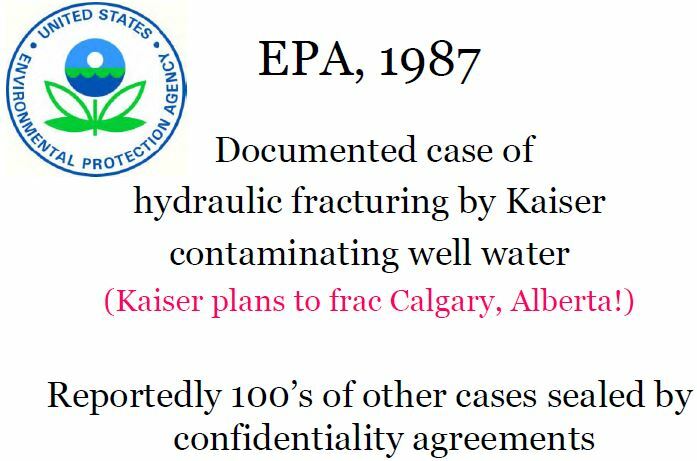 2015: EPA’s Draft report finally released, admits industry frac’s and contaminates drinking water aquifers, listing numerous cases including Rosebud, Alberta, but concludes – in contradiction to the scientific evidence included in the report – no widespread harm to groundwater.